For the second time this month, a drone (this one presumed to be a QF 4) has come spiraling out of the sky. 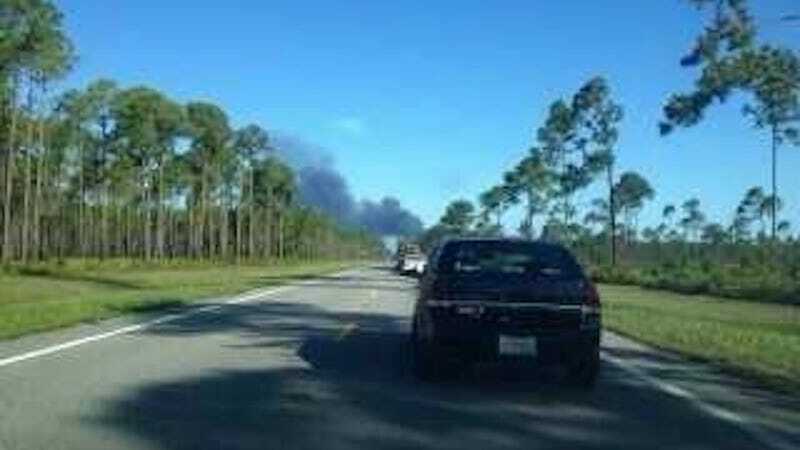 The crash and subsequent explosion happened next to US 98 near Tyndall Air Force Base in—oh what a surprise—Florida. Base and local police and safety officials have closed Highway 98 and are anticipating that it will remain closed for up to 24 hours. This closure is being done strictly as a precautionary measure due to fires resulting from the crash and a small self-destruct charge carried on board the drone. The status of this device is unknown however, it is powered by a short-life battery which will be fully depleted in 24 hours. The charge is used to destroy the drone if it leaves its pre-approved flight plan. Tyndall certainly has experience when it comes to rogue aircrafts falling out from the sky. Their most recent drone crash happened just last week over the gulf of Mexico, and they're the same base that saw an F-22 Raptor hit the ground last year near the very same highway. Unlike the Raptor crash though, this most recent one was thankfully unmanned.